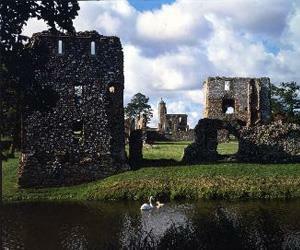 Baconsthorpe Castle01223 582700work CastleVisit the extensive ruins of Baconsthorpe Castle, a moated and fortified 15th century manor house, that are a testament to the rise and fall of a prominent Norfolk family, the Heydons. Over 200 years, successive generations of this ambitious family built, then enlarged, and finally abandoned this castle. Sir John Heydon probably built the strong inner gatehouse during the turbulent Wars of the Roses period, and his son Sir Henry completed the fortified house. In more peaceful times, their descendants converted part of the property into a textile factory, and then added the turreted Elizabethan outer gateway, inhabited until 1920. Off A140 or A148 to Baconsthorpe village. the site is up a track signed from the village.